The Northeast ADA Center receives many questions from various stakeholders about accessible parking requirements for places of public accommodation (i.e. public parking lots, retail stores, doctor’s offices, restaurants, etc.). Given this, we have assembled this FAQ document that summarizes the questions that individuals in New York and New Jersey pose most frequently to our staff about accessible parking. 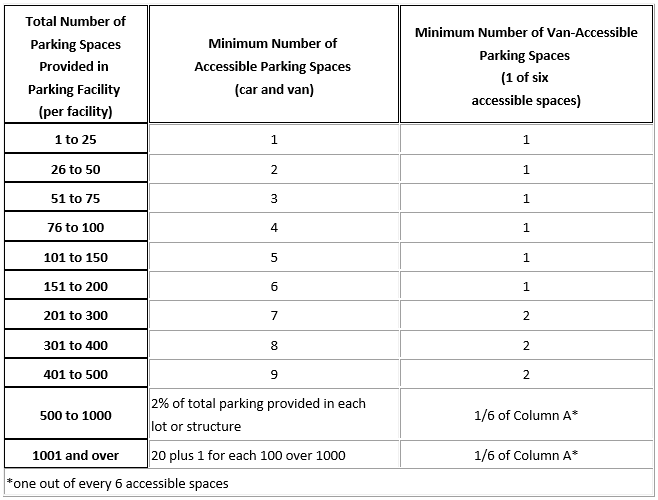 The chart below from the 2010 ADA Standards for Accessible Design Section 208.2 details the number of required car and van accessible parking spaces in a facility, which is based on the total number of parking spaces provided in the facility. The table below applies to both the ADA and New Jersey parking facilities. 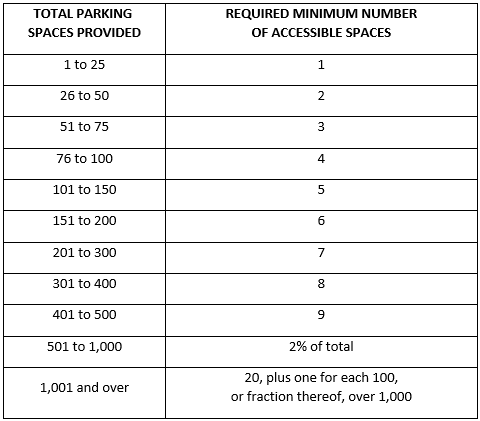 Note that accessibility regulations never dictate how many parking spaces are needed at a facility, but once the enforcing authority with jurisdiction determines how many parking spaces are needed for a facility (typically that is a function of local zoning codes), you can then consult the chart below to determine how many of those parking spaces must be either car or van accessible parking spaces. New York State requires all accessible parking spaces to be designed as Van Accessible (meaning all accessible parking spaces must have an access aisle at least eight feet wide), not only one out of every 6 accessible spaces. For that reason, the chart below indicates how many accessible parking spaces are required in New York State. Accessible parking spaces must be located on the shortest accessible route of travel to an accessible facility entrance (see next question for additional information). Where buildings have multiple accessible entrances with adjacent parking, the accessible parking spaces must be dispersed and located closest to the accessible entrances. For example, if a shopping center has a row of 15 stores, the accessible parking spaces may not all be located at one end of the shopping center, so that the stores at the other end of the “row” are not served by accessible parking. Dispersing the accessible parking spaces to best serve all the tenants is what is expected. In some cases, depending on the site and parking scenario, accessible parking spaces may be clustered in one or more facilities if equivalent or greater accessibility is provided in terms of distance from the accessible entrance, parking fees, and convenience. An accessible route of travel must always be provided from the accessible parking space(s) to the accessible entrance(s) served by the parking area. An accessible route never has curbs or stairs, must be at least 3 feet wide, and has a firm, stable, slip-resistant surface. The running slope along the accessible route (the slope in the direction of travel) should not be greater than 1:20 (5%) for a walking surface, or greater than 1:12 (8.33%) for ramps that are part of an accessible path of travel. Keeping all this in mind, sometimes the shortest route of travel may not always be the shortest accessible route of travel. Accessibility regulations do not dictate the length of accessible parking spaces, as that is typically a function of state/local codes, but accessibility standards do regulate the width of accessible parking spaces and access aisles. Below is a breakdown of the ADA and NJ requirements for the design of accessible parking spaces. State specific signage for these spaces will be discussed later in this document. Parking space identification sign with the International Symbol of Accessibility complying with 703.7.2.1 mounted 60 inches minimum above the ground surface measured to the bottom of the sign. If the accessible route is located in front of the parking space, it is recommended to install wheel stops to keep vehicles from reducing the clear width of the accessible route below 36 inches. Two parking spaces may share an access aisle except for angled parking spaces (see below). 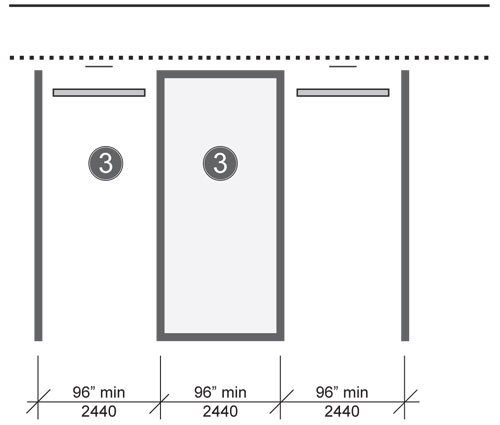 Access aisle width is at least 60 inches, must be at the same level and the same length as the adjacent parking space(s) it serves, maximum slope in all directions is 1:48 (2%), and the access aisle must connect to an accessible route to the building. Ramps must not extend into the access aisle. Parking space shall be 96 inches wide minimum, marked to define the width, and maximum slope in all directions is 1:48. Boundary of the access aisle must be clearly marked so as to discourage parking in it. -Where parking spaces are marked with lines, width measurements of parking spaces and access aisles are to centerlines, except for the end space which may include the full width of the line. -Access aisles may be located on either side of the parking space except for angled van parking spaces which must have access aisles located on the passenger side of the parking spaces. - The surface of accessible spaces and access aisles must be smooth, stable, and virtually level in all directions to ensure safe use for people with disabilities, including those who must load, unload, and transfer to/from mobility devices. 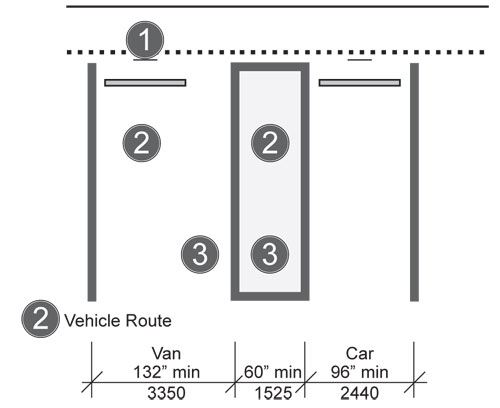 As detailed in the figure above, surface slopes should be as close as possible to 1:48 (2%) in all directions where accessible parking spaces are located. Van-accessible parking spaces incorporate the features of accessible parking spaces from the image above and require the following additional features: a "van accessible" designation on the sign; different widths for the van parking space or the access aisle; and at least 98 inches of vertical clearance for the van parking space, access aisle, and vehicular route to and from the van-accessible space. This is to ensure that vans with overhead lifts have the required clearance to safely enter garages where clearance may be reduced. There are 2 options for the design of a Van Accessible Parking space detailed below. The first image below shows a van-accessible space with a 60-inch minimum width access aisle. The second image shows a van-accessible space with a 96-inch minimum width access aisle. Both configurations are permitted and requirements for van-accessible signage and vertical clearance apply to both configurations. Parking space identification sign with the International Symbol of Accessibility and designation, "van accessible." Note, where four or fewer parking spaces are provided on a site, a sign identifying the accessible space, which must be van-accessible, is not required. Vertical clearance of 98 inches minimum to accommodate van height at the vehicle parking space, the adjacent access aisle, and on the vehicular route to and from the van-accessible space. Van parking space must be 132 inches wide minimum with an adjacent 60-inch wide minimum access aisle. A van parking space of 96 inches wide minimum width an adjacent 96-inch wide minimum access aisle is also permitted (see below). REMEMBER: It is never acceptable to park in the striped access aisles next to spaces reserved for people with disabilities, even if you have an accessible permit or plate. The access aisles provide room for people with mobility devices to transfer safely to and from their vehicles. 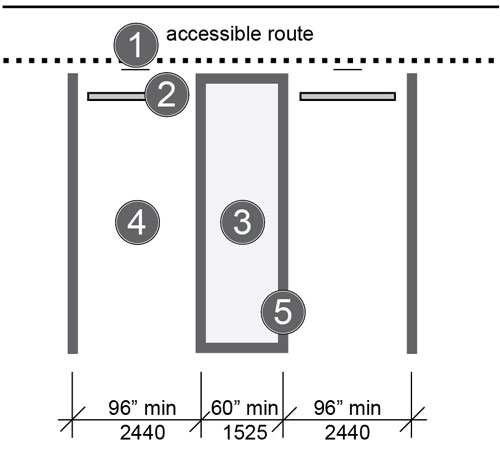 As stated earlier in this document, all accessible spaces must be designed to be Van Accessible with an access aisle that is at least eight feet wide per the Building Code of New York State Section 1106.1.1 which states: “Access aisles. Accessible parking spaces shall be in conformance with ICC/ANSI A117.1 except that spaces shall be provided with access aisles at least 8 feet in width.” So the accessible parking space in NYS must be at least eight feet wide, and all access aisles must also be at least eight feet wide. The color of the striping used on the pavement is not dictated by accessibility regulations in the ADA, New Jersey or New York, but the color used must contrast with the pavement color. Blue is typically used for marking these spaces, although that is not the only color that can be used. The ADA requires that all accessible parking spaces are identified with the International Symbol of Accessibility, and if spaces are Van Accessible, then additional language that states “Van Accessible” must be provided on the sign*. These signs should be installed so that they are visible by someone driving a vehicle, at least sixty inches above grade, measured to the bottom of the lowest sign. *If a facility has a total of four or fewer parking spaces, (including accessible parking space(s) identification of the accessible space(s) with the signage above is not required. In addition to the signs mentioned above that must be provided, New Jersey requires penalty signage that indicates the penalty fines for offenses. The penalty for the first offense is $250 and, for subsequent offenses, a $250 minimum fine and/or up to 90 days community service. Additionally, the NJ Building Code requires that the penalty sign is centered and mounted at the head of each accessible parking space and the bottom of the lowest sign shall be at least 60 inches above the parking lot or sidewalk surface when the sign is parallel to the sidewalk and approximately 72 inches above the parking lot or sidewalk when the sign is perpendicular to the sidewalk. In addition to the International Symbol of Accessibility that must be provided at all accessible parking spaces, the New York State Building Code requires that each access aisle has signage that states “NO PARKING ANYTIME”. These signs shall be permanently installed at a clear height of between 60 inches and 84 inches above grade and shall not interfere with an accessible route from an access aisle. Since all access aisles in New York State are “Van Accessible” because they must be at least 8 feet wide, “Van Accessible” signs are not required at accessible spaces in New York State. What can businesses or other facilities do if they receive complaints from customers about individuals who illegally park in the accessible parking spaces or misuse the spots by parking in the access aisle for an accessible parking space? As the enforcement of parking regulations is a local matter, instances in which individuals illegally park in a space marked for accessible parking should be reported to the proper law enforcement authorities. In order to park in accessible spaces, the vehicle must display valid state/city issued accessible parking placards or plates. In your area, if the local police are responsible for addressing violations, they should be notified as soon as possible. In the case of a business, you can alert the manager or owner and they can contact the local police. If a local security company patrols your parking area, they should be notified. Remember that many people have disabilities that may not be obvious, often referred to as “hidden disabilities”. Not everyone that uses accessible parking spaces uses a wheelchair or other mobility device either, so it is not best practice to rush to judge whether or not someone is abusing accessible parking privileges. It is important that accessible features be maintained as accessible, and outdoor spaces can be especially challenging because of weather and other conditions. Accessible parking spaces, access aisles, and routes serving these parking spaces must be maintained in good repair and kept clear of snow, ice, or fallen leaf build-up. This is part of the obligation to not only construct, but also to maintain, accessible features. NJ - The New Jersey Snow Removal Act (C.394:4-207.9) requires the removal of snow and ice from accessible parking spaces within 48 hours of the time that the weather clears. Non-compliance with this law can result in a fine of $200 to $500. NYS - New York State - S 1203-e. Dumping snow onto parking places for handicapped prohibited. Any person who knowingly dumps or shovels snow onto a parking place for handicapped persons rendering such place unusable for parking purposes shall be subject to a fine of twenty-five dollars for the first offense and a fine not to exceed one hundred dollars for every offense thereafter. However, a local or municipal government may, by local law or ordinance, establish fines higher than those established in this section, but in no instance shall the fines exceed fifty dollars for the first offense or two hundred dollars for the second or subsequent offense. Yes. The NYC Department of Transportation administers NYC specific parking permits for people with disabilities. Unlike the New York State permit, the NYC permit entitles drivers to park only in New York City. Specifically, the NYC permit allows the driver to park at most curbsides on city streets including in all “No Parking” zones (except those marked as taxi stands); in “No Parking”, “No Standing” or “Authorized Vehicles Only” spaces authorized for doctors, press, diplomats and government agencies; at metered parking without paying; in “No Standing, Trucks Loading and Unloading” or “Truck Loading Only” zones except for specified restricted hours. Note that the NYC permit cannot be used in any "No Stopping" zones; in any "No Standing" zones other than those listed above; in front of fire hydrants, at bus stops or in crosswalks. Double parking is never permitted. The unique parking privileges that come with the NYC Parking Permit for people with disabilities are exclusive to NYC and do not apply elsewhere. Please visit the NYC DOT website at http://www.nyc.gov/html/dot/html/motorist/pppdinfo.shtml#nycpermit to learn more about the NYC Parking Permit for People with Disabilities. Each state also establishes criteria and procedures to issue accessible parking permits (often in the form of distinctive license plates or placards) to individuals with disabilities. Enforcement activities related to these issues (fraudulent use of permits, illegal parking in accessible spaces, etc.) are typically carried out by state and local authorities, such as city police departments. To learn more about how to obtain an accessible parking permit in NYS, please visit the NYS Department of Motor Vehicles here: http://dmv.ny.gov/more-info/parking-people-disabilities. To learn more about how to obtain an accessible parking permit in NJ, please visit: http://www.dmv.org/nj-new-jersey/disabled-drivers.php.